We are delighted to announce promising young cricketer Jordan Silk, as the most recent addition to our team of talent at Sunstar. The 21 year old made a blistering start in the First Class arena with Tasmania, scoring two centuries in his first three games, including an impressive 108 in the Sheffield Shield final they won last month against Queensland. He was rewarded with selection in the Australia A squad that will tour the UK in June. Born and bred in Sydney, Jordan made the move south to Tasmania, to further his cricket career and he has made the most of his opportunities. 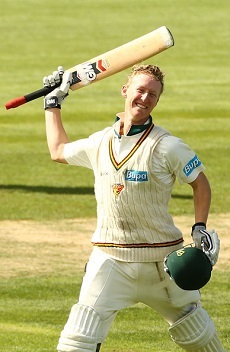 Jordan is one of four cricketers now represented by Sunstar, joining Mitchell Starc, Ellyse Perry and Steve O’Keefe.